I celebrated my 14th wedding anniversary recently and as you might guess, for such an ordinary number and because it was karate night, we did nothing. Well, we said we’d do nothing but AT bought me some lovely long-stem roses, and I made him some choux pastry. And yes, it was looking as boring as it sounds, so, like George and his medicine, I came up with something marvellous. I’d intended to fill the profiteroles with custard, but as I bit into my test subject I was reminded of a much beloved German Bee-Sting cake. Without the need to bake an entire cake, I managed to re-created the important parts of this recipe with much less hassle. A little bit of cream and some flaked almonds is all you need to transform boring old profiteroles into something truly delectable. In your stand mixing bowl, mix the flour and sugar. Bring the butter and water to the boil in a saucepan and take off the heat as soon as it comes to the boil. Pour the hot mixture into the flour and mix with the dough hook until a dough forms and starts to pull away from the sides. Now pour the eggs in slowly as the machine kneads the dough. The mixture will become wet and glossy. When it’s all mixed in and smooth, put aside. Grab a baking tray and sprinkle some water on to it, shake of any excess. This helps to create some steam and a nice rise in the pastry. Put heaped teaspoons of the mixture on to the tray, nicely spaced. Then bake for 5-10 minutes. Then turn the heat up to 220C and keep baking until nicely puffed and golden. Take out of oven and prick straight away to release any steam. Cool on a rack. Pour the butter, cream, sugar and honey into a sauce pan and bring to the boil. Simmer until the caramel becomes a little bit golden. Add the almonds and stir in. The mixture should be runny, but will harden as it cools. Slice the buns in half and keep all the tops together. Spread the almond mix on top of all the tops and place under a hot grill to burnish and firmly set the glaze. This bit is a little bit fiddly. Heat them until the colour comes up and the caramel sizzles a bit. Let these cool on a tray. Spread a layer of thickly whipped cream to the bases, followed by a dollop of firm vanilla custard. 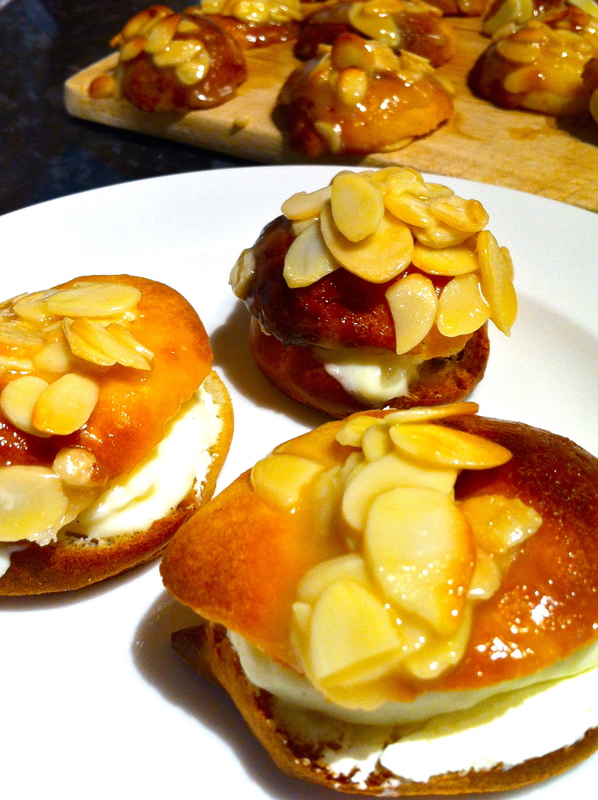 I used Waitrose fresh Madagascan vanilla custard – which held together nicely inside the delicate buns. Finish by adding the cooled, glazed tops and you’re done.